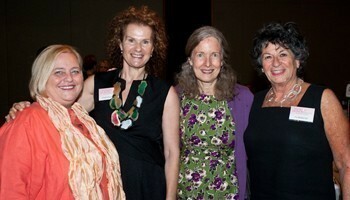 Women of influence join the Australian push to support the global philanthropy movement - Women Mobilising Millions. Already three Australian women have pledged a million dollars each to support a new campaign in Australia known as Women Mobilising Millions – and while they remain anonymous, several hundred influential women (and men) turned out for the public launch this week to kick off the Australian arm of the global philanthropy movement. Among the Melbourne audience were some of Australia’s most powerful women who have put their substantial influence behind the campaign, including philanthropist Jeanne Pratt. The launch event was organised by philanthropist and Chair of the Australian Women Donors Network, Eve Mahlab AO and Deputy Chair Carol Schwartz AM. Christine Grumm and Dr Helen LaKelly Hunt, co-founders of the global philanthropy campaign Women Moving Millions (the US name for the campaign), called on Australian women to elevate women and girls to the top of the philanthropic priority list. According to the Australian Women Donors Network, there is a growing awareness in Australia of the rationale for increased investments in women and girls, a statement supported by the large turnout at the Melbourne launch. Eve Mahlab urged the audience which included Terry Bracks, the wife of former Victorian Premier, Steve Bracks, and Margaret Jackson the former Chair of Qantas, to be aware of and support gender sensitive giving. She said donors should ask themselves ‘does this project support women and girls?" before signing the cheque. International founder Christine Grumm told the audience that funding women and girls is recognised as the most effective way of creating long-term, sustainable social change. Dr Helen LaKelly Hunt said the idea for the campaign began when she realised women were funding at the million dollar level, but were not pooling their funds to invest in women’s advancement. She said Women Moving Millions began with the goal of raising $150 million in 2 years – and despite the economic collapse, when the deadline arrived last year the campaign had raised $180 million in donations and pledges. The Australian Women Donors Network is a community of women and men who fund projects that invest in women and girls. •	Embedding gender awareness into mainstream grant making so that it addresses the circumstances and needs of women and girls, which are often difference to those of men and boys.